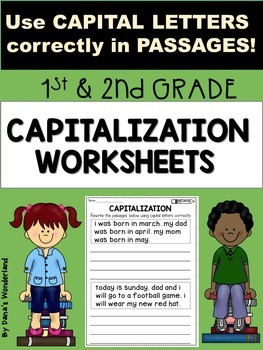 This product contains 16 worksheets that focus on capitalization. 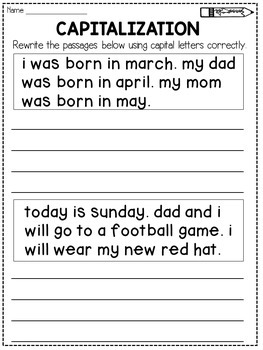 Each worksheet features 2 passages that have to be written again using correct capitalization. The main purpose of this product is to help students get used to USE A CAPITAL LETTER AFTER A PERIOD. 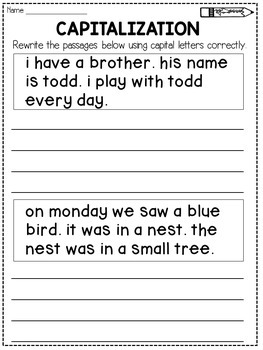 Many of my students used to begin a sentence with a capital letter if they were asked to write a sentence at a time, but they got confused if they had to write a passage or a story. These worksheets really helped them with this skill. The passages vary in difficulty for easy differentiation. 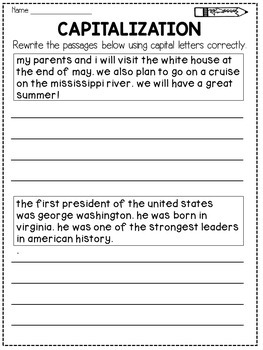 L.2.2 a: Capitalize holidays, product names, and geographic names.